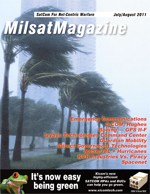 Key Military Marketing Trends The strongest trends impacting military demand for commercial satellite capacity over the next decade include growing use of satellite capacity to support new types of warfighting, which are increasingly dependent on broadband communications. Key among these are the expanded global troop deployments, primarily by U.S. defense forces, as well as use of satellites to support Intelligence, Surveillance and Reconnaissance (ISR) activities, in particular those carried out using a variety of Unmanned Aerial Vehicles (UAVs) or Remotely Piloted Aircraft (RPAs). It is no secret that the Department of Defense (DoD) and the intelligence community (IC) are dealing with a new frontier of information collection and dissemination. Over the past five to seven years, technological advances in the areas of satellite technologies, geospatial imagery, full-motion video, and other raw data have increased the volume of information available to decision makers and warfighters. Under Mr. Trenchs leadership, the Navigation Systems mission area is responsive for the design, development, and production of the GPS IIR/IIR-M and GPS III programs. The mission area leverages technology, program management, and operating excellence gained through GPS program execution to drive growth and develop innovative, affordable Position, Navigation and Timing (PNT) solutions. Mr. Trench joined GE Aerospace in April 1978 as a hardware design and development engineer. Between 1978 and 1994, he held a number of increasingly responsible positions associated with the design, development and testing of ground systems used for command and control of Department of Defense and NASA communications satellites. In 1994, Mr. Trench was appointed the director of engineering at Lockheed Martins Missiles & Space Valley Forge, Pennyslvania facility. In 1996, he was named the Landsat 7 program director. Mr. Trench joined M&DS in January 1999 as the director of Delaware Valley Technical Operations and was soon promoted to vice president in August 2000. In June 2002, he was appointed vice president of the Department of Defense Systems line of business, responsible for ground systems supporting DoD and civil space customers. Philip Harlow was appointed President and Chief Operating Officer of XTAR, LLC, on June 1, 2010. He is responsible for the growth and strategic direction of XTARs Government business, overseeing the management, marketing and technical aspects of the company. Previously, Mr. Harlow worked as Chief Technology Officer for CapRock Communications (since acquired by Harris Corp). In that role, Mr. Harlow was responsible for all aspects of engineering, IT, infrastructure development, new product management and strategic planning. Prior to CapRock, Mr. Harlow was Vice President of Engineering and Technology at DRS Technical Services, provider of satellite, terrestrial and enterprise-wide network communications services. He joined DRS in 2006 from Intelsat General where he served as Vice President of Engineering following the acquisition of PanAmSat. Before joining PanAmSat/G2, Mr. Harlow was instrumental in the PanAmSat acquisition and integration of Esatel Communications, where he served as Vice President for Business Development. Mr. Harlow also worked at Loral Orion as Director for Sales Engineering supporting the North America Sales Group. Mr. Harlow graduated from the Royal Military Academy, Sandhurst, United Kingdom, and holds an honors degree in Electronic Systems Engineering from the Royal Military College of Science. He also has a Masters degree in Systems Engineering from The George Washington University. In April of 2008, the Department of Defense created a new Task Force empowered to significantly improve ISR capabilities in Iraq and Afghanistan. Increasing broadband SATCOM On-The-Move (SOTM) is a strategic requirement for Network Centric Warfare. Operating at higher frequencies is intrinsically linked to achieving this objective. The Wideband Global Satcom (WGS) System offers U.S. DoD and Australia  through joint partnership  an opportunity to access significantly increased SHF and EHF spectrum. This spectrum access is essential in realizing broadband SOTM across a variety of military platforms including air, naval and the more challenging land mobile. The military has long relied on satellites for long-distance communications. The success of the early satellite trial phases in the mid 20th century led to increasing reliance of the satellite infrastructure to dependably deliver information to distant military bases over free space. In late December of last year, the Army published the Army Capstone Concept. The concept is subtitled Operational Adaptability: Operating under conditions of Uncertainty and Complexity in an Era of Persistent Conflict. The new concept is a guide to how the Army will apply available, yet dwindling, resources to overcome adaptive enemies, while concurrently articulating how to think about future armed conflict. This concept will serve as the foundation to drive development and modernization efforts. It provides the common framework for thinking about the conduct of future joint land operations under the conditions of uncertainty and complexity. The Army Capstone Concept helps place modernization decisions within the conceptual foundation of our DOTMLPF (doctrine, organization, training, materiel, leader development, personnel and facilities) requirements and development.